A few weeks ago I wrote a post on Mac apps I use for WordPress publishing. Since we have just released the awesome (if I do say so myself) ManageWP iOS app, I thought that it would be timely to publish a roundup of the top iOS apps for WordPress bloggers. Whilst the iOS platform is not well-served in terms of apps that are specific to WordPress (with the official WordPress app and our own offering being the only two), there are still a few apps out there that you can use to boost your mobile blogging efficiency. It also gives you direct access to your desktop dashboard, should you need to carry out more advanced tasks. I’ll be honest with you — the iPad experience is far superior to the iPhone/iPod. Whilst the app offers the same level of functionality across all platforms, the iPad’s size really lends itself well to the depth of functionality on offer. 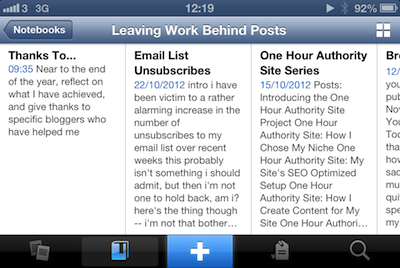 Having said that, the WordPress iOS app is pretty damn slick regardless — if you own an iOS device, you should have it. Whilst Evernote is by no means a “blogging” app, I find it absolutely invaluable as a blogger. It is where I store all post ideas for the blogs that I write for. Each blog gets its own folder and each post idea gets its own note. A few post ideas for my blog stored in Evernote. One of the main reasons I use Evernote for this is because I can add and edit content from anywhere. I tend to get a lot of ideas when I am away from my laptop — whether it be on a train or in bed — but I always have my trusty iPhone with me. Evernote syncs your data via the cloud, so any pearls of wisdom you make a note of on the road will be ready for you when you get home. Its absolutely invaluable for me as a blogger. Because of the depth of functionality, Blogsy is an iPad only app. To be fair, you would struggle to get anything done with this app on an iPhone — there’s just too much going on. 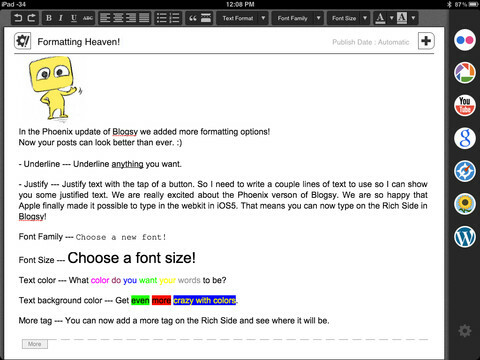 Blogsy’s advanced features do come at a cost — at the time of writing it will set you back $4.99. Hardly a hefty price to pay if you are in look of a mobile blogging solution. Whilst it isn’t as feature packed as its iPad-only bigger brother, it offers a simple solution for those blogging from smaller devices. 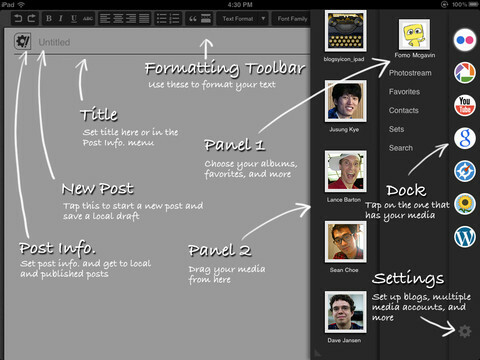 The interface is simple and intuitive, and if BlogPress delivers on your needs, it is also available for the iPad. What Apps Do You Use for WordPress Blogging? 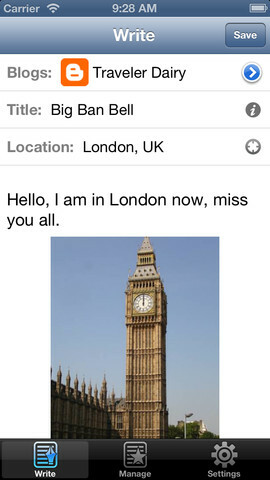 As I alluded to at the beginning of this post, blogging apps are pretty rare. As WordPress users we have pretty slim pickings. Having said that, an embarrassment of choice is not always a good thing — the above apps (along with the ManageWP app of course) are all I need in order to run my WordPress blog on the go. But what about you — what apps do you use to help you with your blogging? Anything that I haven’t mentioned above? Let us know in the comments section! I totally depend on evernote, Dropbox and Blogpress for my business. Without these three, I can’t even imagine to work efficiently. But, the rest of your recommendations also look great and the review about them is quite impressive. Will surely try them out. Thanks Tom for your awesome reviews. Hi, I design sites and don’t really blog very often. I’ve used the WP iOS app multiple times and for an admin looking to make changes / customizations / troubleshooting on the road for a self-hosted WP site I have not found it very helpful at all. I’ve made suggestions on their site and know they will get to it eventually. It would be awesome to have a couple dozen WP sites in the app, login on the go, and edit what I need to for my clients with ease instead of using Chrome/Safari on the iPhone. Do you have any suggestions for other, more admin type, apps for WP? For my purpose the app is lacking but for a blogger, they just updated the whole app this last month, and it looks awesome. Cheers! Love the posts / services you have. Huge fan. 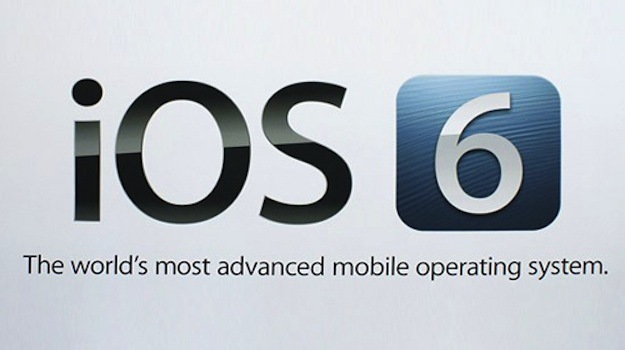 Harsh, have you used the ManageWP iOS app and what do you think about it? I have an iPad and I find that it’s not very good for blogging or creating content. I haven’t used it personally, but I keep hearing lots of good things about Poster.